Marian De Forest was born in Buffalo, New York 2/27/1864 to Cyrus H. & Sarah Germain Sutherland deForest. Marian's schooling began with private tutoring because of an eye injury. With extraordinary determination and persistence, she overcame the handicap and graduated from Buffalo Seminary in 1884. After graduation, Marian began her career as a reporter, one of the first women in the profession in Western New York. She was a critic and editor of the Women's Department at The Buffalo Express, now The Buffalo News, for 20 years. In that capacity, she met some of the most celebrated figures of the theatrical and musical world. In recognition of her talent, she rose to become city editor of The Buffalo Commercial. During the Pan American Exposition of 1901, Marian served as Executive Secretary of the Board of Women Managers. 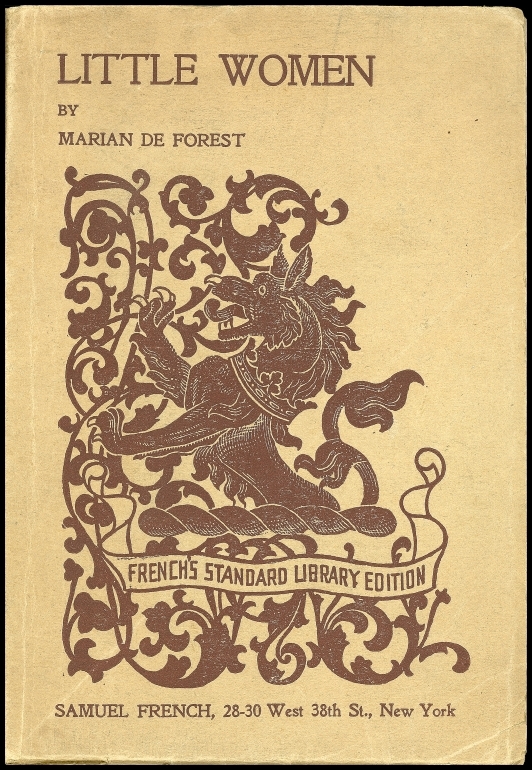 In 1911, Ms. deforest wrote the play Little Women based on Louisa May Alcoft's famous book. This drama is said to have launched the career of Katherine Cornell, then a local actress. After performances in Buffalo and New York, the play opened in 1919 at the New Theatre in London, England, with Ms. deforest accompanying the cast. Some of her other plays include Erstwhile Susan, Mr. Man. and a number of unpublished works. She also collaborated with Zona Gale in the production of Friendship Village, in a series called Neighbors over WEAF, national broadcasting system. 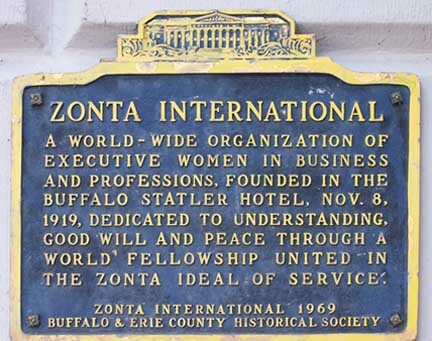 On November 8, 1919, at the Hotel Statler, Marian gathered a group of like minded prominent professional women to form the Zonta Club of Buffalo. Zonta is a service organization of executive women working to improve the status of women worldwide and help women reach their rightful place in their profession. Marian understood how important it was to break through the "glass ceiling" long before the term was ever used. 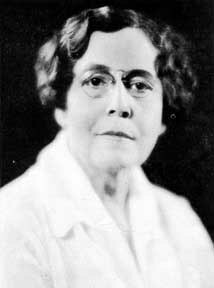 Ms. deForest established the Buffalo Musical Foundation and became its manager in 1924. Working closely with the School Department of Buffalo, she arranged and promoted symphony concerts for children. In the early 1930's she played a major role in the founding of the Buffalo Philharmonic Orchestra. In 1932, Marian promoted the first Pops concert that gave work to unemployed musicians. She also served on the Board of the SPCA, and for 14 years was befriended by a cat named "Sammy" that made its home with her. Marian served on the Board of the Buffalo Public Library, becoming the only woman member of the Buffalo Public Library Trustees. Marian was an honorary member and a regular visitor of the Twentieth Century Club. When the founder of this club, Charlotte Mulligan, started the "Scribblers," an organization for local writing women, Ms. deForest was one of the first invited to join. Marian lived at various addresses in Buffalo. In 1888-1893 she boarded at 44 St. John's Place; 1896 she boarded at The Ganson, 262 Delaware Avenue; in 1898 she lived at 67 Park Street; in 1900-1922 she lived at 26 Irving Place; and from 1924 until her death she lived at 30 Irving Place. Marian died on February 17, 1935, in Buffalo General Hospital. The Buffalo Times headline brought the news "Marian deforest dies after notable career; city loses woman leader." After services at Trinity Episcopal Church, of which she was a member, Marian was buried at Forest Lawn Cemetery in the same section as her parents. In October, 2001, Marian deForest became the first woman from Buffalo to be inducted into the National Women's Hall of Fame in Seneca Falls, New York. Ms. DeForest joined 176 eminent women to be so honored since 1969.